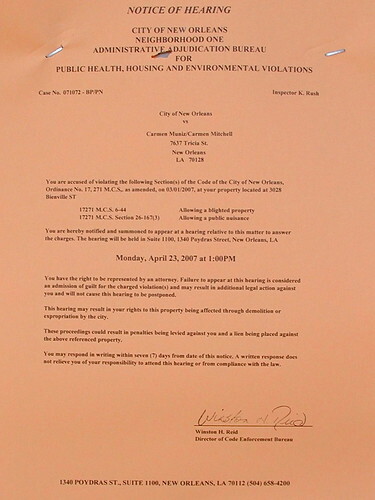 On Sunday, April 22nd, I noticed a number of orange notices posted on houses on Bienville, some on the 3000 block, some on the 3200 block. As I was taking this picture some people rolled up in a truck to take a look at another one of the houses with a notice on it. I got to talking with them. They said their friend was the owner and that he asked them to consider purchasing the house, presumably to rehab and rent. They asked me questions about the neighborhood, including a very odd question about the trailer site across the way: “Is it mixed?” What kind of question is that? Do they think FEMA is maintaining racially segregated trailer parks? We desperately need someone to start fixing up houses in our neighborhood. The majority are still vacant. Some haven’t been touched since the Federal Flood. But as much as I hate to say it, these people did not inspire confidence. I got the feeling that they would invest as little as possible in the house and rent it for as high a price as possible. I could tell as they looked around they though this was a slum ghetto. Our area was a little rough before Katrina but now I have the feeling it’s going to go down the toilet. Did you notice that the placard said you had 7 days for the date of the notice to respond in writing and the placard was undated? It seems to me you would have noticed these things if they had been up very long. I know I see the Jefferson Parish trailer notices just driving around. Meekorouse, I actually had to ask, “Mixed? What do you mean?” And they clarified they meant racially mixed. Bart: that’s truely messed up. 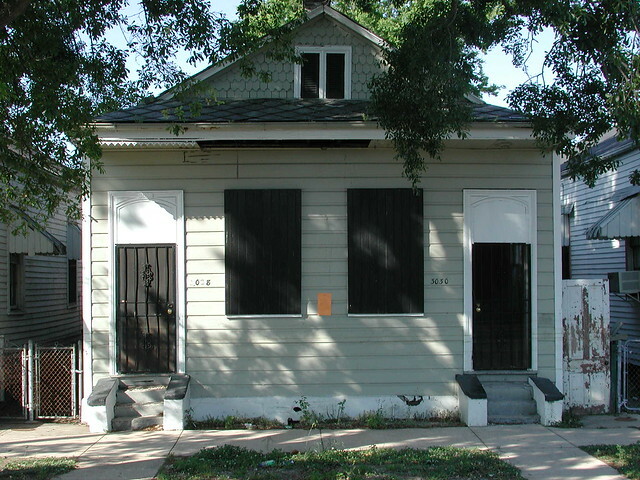 I guess I thought maybe after Katrina some things about New Orleans would change..